LIVERMORE - Jane St. Pierre, 93, of Livermore, died very peacefully at home on Thursday, Feb. 7, 2019, with her 13 children by her side. 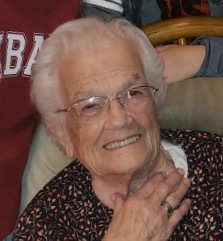 LIVERMORE – Jane St. Pierre, 93, of Livermore, died very peacefully at home on Thursday, Feb. 7, 2019, with her 13 children by her side. Jane was born Sept. 12, 1925, in Jay, the daughter of George and Bertha (Moreau) Castonguay. She married Romeo St. Pierre and raised their family on the farm, on River Road in Livermore. She is survived by her 13 children, Norman (Janice), George, Phillip (Sally), Roger (Susan), Robert (Ruby) Raymond (Judy), Anita Hill (Patrick), Annette Lake (Rocky), Anna Lake (Reggie), Susan McCarthy (Kevin), Yvonne Demillo (Mark), Pauline Bovin (Doug) and Bertha Flagg (Theodore). She was blessed with 32 grandchildren; and 55 great-grandchildren. Jane is also survived by her siblings, Frank Castonguay, Bertrand Castonguay, Connie St. Pierre, Annette St. Pierre, Laurianne Castonguay, Maryette Castonguay and Elaine Castonguay. She was predeceased by her parents; her husband, Romeo St. Pierre; siblings, Bernadette Castonguay, Romeo and Andre Castonguay. A Mass of Christen Burial will be celebrated 11 a.m., Monday, February 11 at St. Rose of Lima Church, 1 Church Street, Jay. Visitation will be held 4-7 p.m., Sunday, February 10, at FINLEY FUNERAL HOME, 15 Church Street, Livermore Falls. Interment in the spring at Holy Cross Cemetery, 445 Park Street, Livermore Falls.